Mother's Day (11th March) is a great opportunity to celebrate the amazing women in our lives and I look forward to it coming around each year, not least because I get breakfast in bed - a favourite treat! I'm also fortunate enough to still have my own mother living close by and to have a great relationship with her. My father passed away suddenly in his 50's and my mother has been a powerhouse ever since, supporting my siblings & I and becoming the most wonderful grandmother to all of our children. She makes the best fudge in Ireland and knits *the* best jumpers - not the usual embarrassing granny creations. 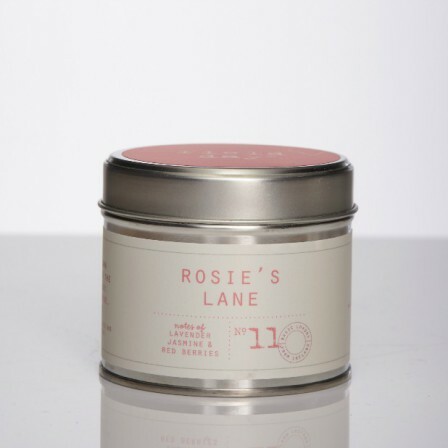 She's the inspiration behind the Rosie's Lane Candle Tin. I have lovely memories of the time spent in our cottage in the Mourne Mountains, surrounded by pretty lanes and meadows leading you down to the shore. But for Mother's Day, I always give her Field Day Wild Rose - it's the most uplifting fragrance, especially at this time of year when spring is struggling to make itself seen. Forget all the bad associations you might have with traditional rose fragrances. This is a authentic tea rose fragrance enriched by rose otto notes and a hint of plum. Even men buy it as it's not distinctly feminine. Available in the full range of Field Day products - large and votive candles, drawer liners, diffusers, hand cream, hand wash, fresheners and sachets, it's so easy to make up a gorgeous mixed gift. It also pairs up perfectly with our Linen fragrance with many people buying a candle in one and a diffuser in another. We dispatch all orders the next day so you can order right up until Wednesday 7th March for Irish and UK orders. We can add in a personal message and every order over £50/€60 benefits from free shipping. And that's not all - we add a FREE freshener into every order! Sure what more could you ask for this Mother's Day?